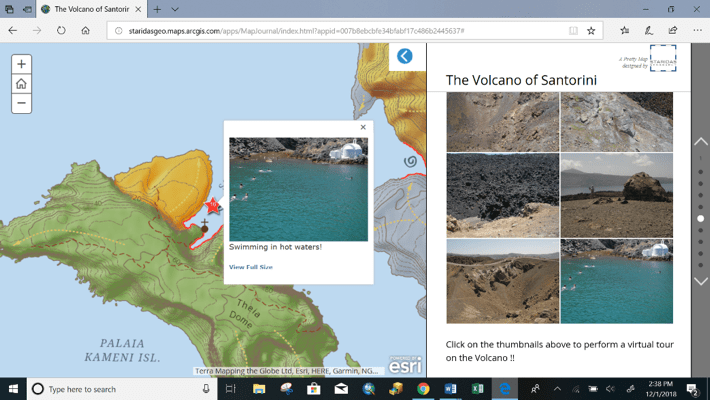 The first prize winner in the 2018 ESRI Storytelling with Maps Contest, “The Volcano of Santorini” takes you on a contemporary, educational tour of the Santorini volcanic islands off the coast of Greece in the Mediterranean Sea. The author/cartographer displays 22 maps and uses various tools to seamlessly present this unique volcanic feature. A link to this amazing work is below. The story begins with images of the geoformations of the two most active islets in this five-island formation. 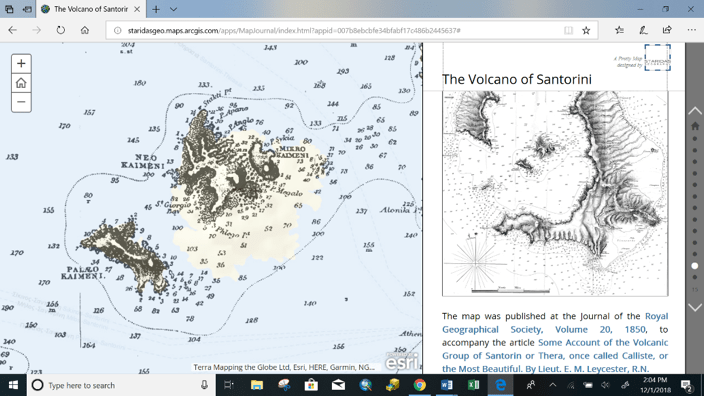 The first three maps and their text serve as an overview of the story, including: an introduction, a table of contents, and, most impressively, a detailed map and legend of the geoformations of the islets, namely Palaia Kameni and Nea Kameni. 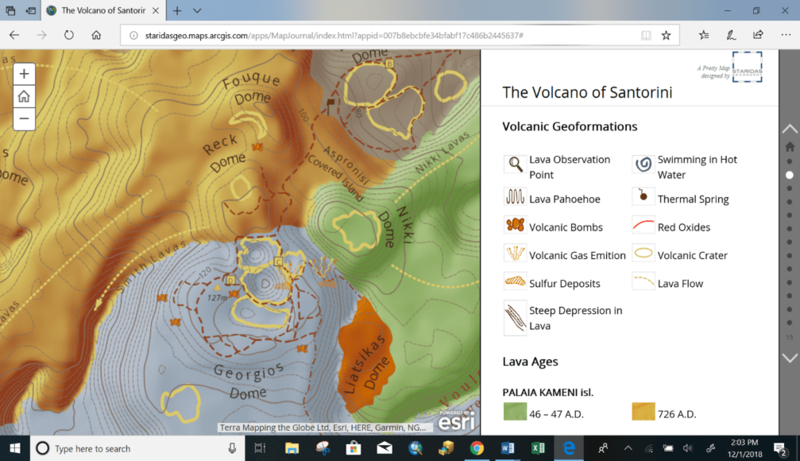 This encompassing map includes topology, several types of man-made features, multiple types of volcanic geoformations and is color-coded to illustrate dated lava ages. The next group of maps illustrate the geography of the entire Santorini area, the geotectonic context of the larger volcanic arc which encompasses much of the eastern border of the Mediterranean Sea and the volcanic evolution of the islands. The latter map is a raster created with aerial and satellite images. The viewer can toggle between the raster imagery and the geology imagery described above to more clearly understand the differences between the various lavas. The following set of ten maps takes you through a chronological history of Santorini’s volcanic activities and each uses unique tools to illustrate its text and visual contents. 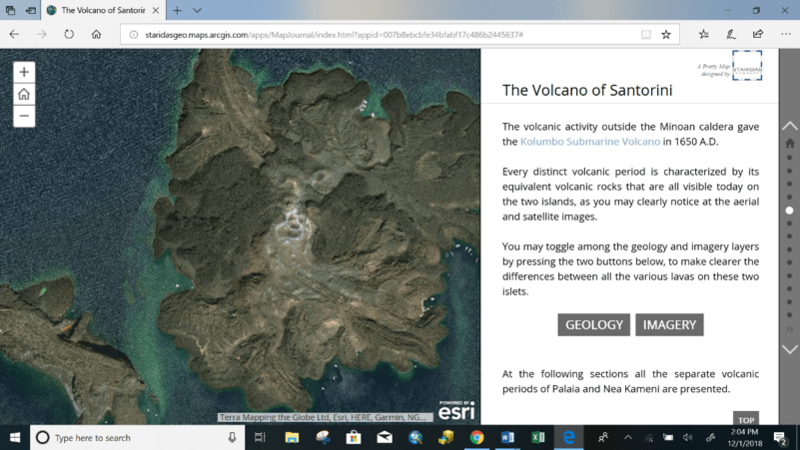 As you read about a particular volcanic event, using automatic panning and zooming, the author takes you to the location on the islet he is featuring. Included is a map displaying a submarine volcanic event which created the reef that surrounds the land today. It is color-coded to illustrate water depths of this volcanic feature. Next, two historical maps from the early 19th century are presented. They give cartographic evidence to support the current data on the islands’ volcanic activity and the interpretation of its history. You can toggle between these historical maps for comparison. The viewer is brought up to date by one of the last maps in the story in a section titled “Volcanic Evolution at Present and Future”. 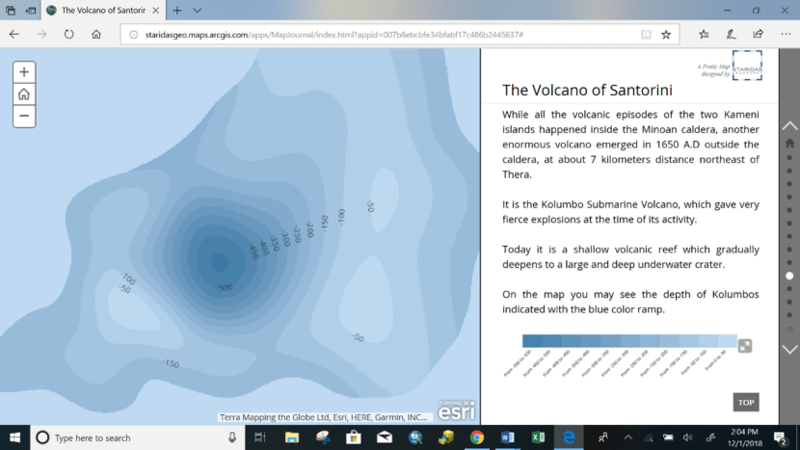 You see the original, well-labelled map and are taken on a virtual tour of the islets via a georeferenced photo gallery. Various volcanic features are presented and captioned at their location on the islet. The set includes a photo, illustrating the significant human presence on this popular tourist destination, of visitors swimming in the thermally heated waters surrounding the islet. The epilogue of the story guides you to the following: a description, image and where to find a printed version of the map, sources and links to further reading, details about the creation of the story map, contact information, and social media links. Using GIS, the story of the creation of this unique place is told, unlike a documentary film or a book, through personal interaction and dynamic tools. It allows the viewer to discover at his own pace and learn through visual images, which may allow for deeper understanding and retention.